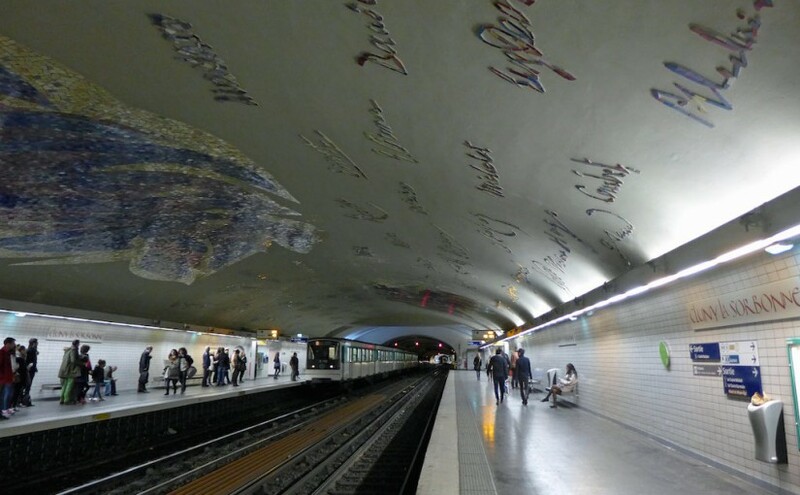 After the Metro station Arts et Métiers last month, let’s discover another gem of the Parisian underground life: Cluny La Sorbonne, on line 10, in fifth arrondissement of Paris. This metro station had opened for the first time in 1930 but closed nine years later as there were too many stations in the same area. Nevertheless it reopened in 1988 to connect with RER B line after the creation of a new hub around Saint Michel. This station is unusual as it does not have two but three tracks : the central track is inaccessible to travellers and was built to connect with metro line 4. But the most impressive is the ceiling of the station! It is decorated with two beautiful mosaic giant birds and with the reproduction of the autographs of famous French authors, scientists, statesmen who used to spend time in the Latin Quarter : Pascal, Rabelais, Molière, … Those mosaic signatures are really amazing and while waiting for the train one can try to guess which famous person lies behind each of them. The whole decor was made in 1988 by the French artist Jean Bazaine. Back to earth : the Musée de Cluny near the metro way out, is one of the most fascinating museums in Paris for both its architecture and collections. Do not miss the Roman baths and the famous ‘dame à la Licorne’ tapestries!